Pink Swan Ashtray, Roses - 139 Discounts Apply ! 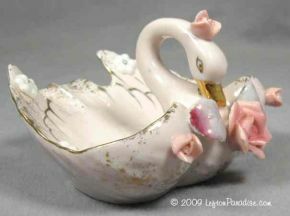 Lovely little pink swan ashtray or trinket dish. It has applied roses and leaves and some raised flowers. There are also sponged gold leaves. The piece is 3 inches wide and is marked 139 with a color crown logo.